In honor of NY Fashion Week, Miss Piggy (who made a special appearance at the Opening Ceremony Fete at the Ace Hotel) was kind enough to answer a few questions exclusively for the blogging community! Q: What is Disney’s “The Muppets” about? It’s moi’s story, of course. It’s about how I am working in Paris and Kermit and the other Muppets come over and beg me to come home. I run the complete gamut of acting—from smiling to frowning. It’s got Oscar® written all over it—and I’m not just talking de La Renta. I have heard rumors that there’s another storyline in the movie that doesn’t involve moi, but who really cares about that? Moi plays moi. It’s a casting no-brainer. 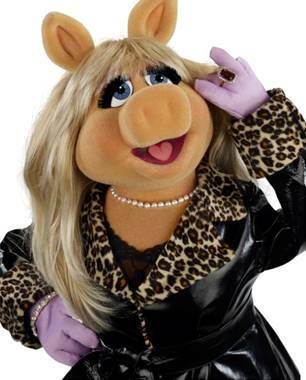 Naturally, all of Hollywood’s top actresses tested for the part—Roberts, Streep, Winslet, Jolie, Bullock—but in the end they decided that there is only one moi and I’m it! In the movie, I portray the plus-size fashion editor of Vogue Paris—I’m in charge of a whole office full of editors who all want to look just like moi. But of course, Kermit wants me back with the Muppets to save the day and put on some big show. Can I resist? Well, see the movie and find out. Q: How does your life differ from the characters you portray on the big screen? In real life, my wardrobe is much, much bigger and more expensive, but I’m a lot like what you see on the big screen. The camera does add a few pounds—when people meet me in person they’re always amazed at how svelte I am. Take my word for it. Q: What made you agree to star in Disney’s “The Muppets”? It was written especially for moi. And they said I could keep all the shoes. Q: What is the funniest scene in the film? The scene where Kermie begs me to come back to Hollywood with him is the funniest scene. I’m hilarious; and the frog isn’t half bad either. There are so many very funny scenes in the film… and guess what, moi is in all of them! Coincidence? I don’t think so. Q: What was it like working opposite Jason Segel? Jason is a sweet, sweet man… and a very funny comedic actor. Of course, when I heard he wrote the movie and could write my part even bigger, we became best friends forever. There was a little tension at first, but once Amy learned about not touching the frog, we became fast friends. We hang together whenever we’re in the same city, which up to now has been… let’s see… never. What can I say about Kermie and moi? Separately we’re fabulous and together we are absolute legends—like Astaire & Rogers, Tracy & Hepburn, Oprah & Stedman. Walter is delightful! He worships the Muppets and especially moi. And as everyone knows, I absolutely adore being worshipped. Q: You are a fashion icon. What is your secret? Never wear anything that requires a hoist to get into. There is no such thing as too much accessorizing. If it’s expensive, it fits. Style comes in all shapes and sizes. Therefore, the bigger you are, the more style you have. Shop. Eat Chocolate. Pose for photographers. Rinse. Repeat. I’m a diva. I have people to schedule my free time. You have no idea how time consuming that is. Q: Are you and Kermit together? Of course we’re together. In the movie, we seem to be apart, but that’s just for dramatic tension. In real life, we’re fabulously happy and the longest-running interspecies couple in all of Hollywood. Q: Why should audiences see Disney’s “The Muppets”? Because moi is in it! What a silly question! It is the best movie I have ever made…and therefore the best movie ever made. Other than that, it’s got a lot of laughs and you’ll have a good time. Are those enough reasons for you? ‘Like’ THE MUPPETS on Facebook.